Aisha Hinds, John Cho. Photo ©2013 Paramount Pictures. Photo by Zade Rosenthal ©2013 Paramount Pictures. All Rights Reserved. Alice Eve, Simon Pegg, Karl Urban, Chris Pine. 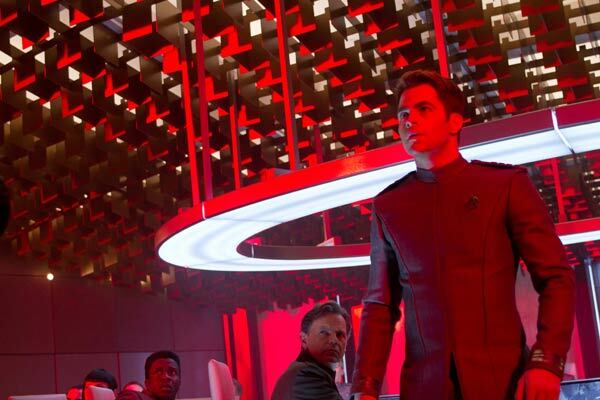 Photo ©2013 Paramount Pictures. All Rights Reserved. 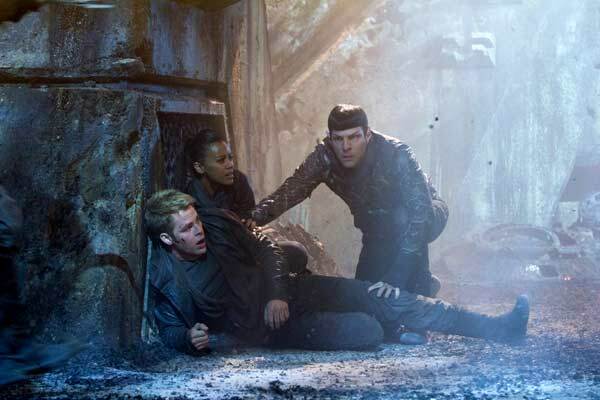 Chris Pine, Zoe Saldana, Zachary Quinto. Photo ©2013 Paramount Pictures. Bruce Greenwood. Photo by Zade Rosenthal ©2013 Paramount Pictures. All Rights Reserved. 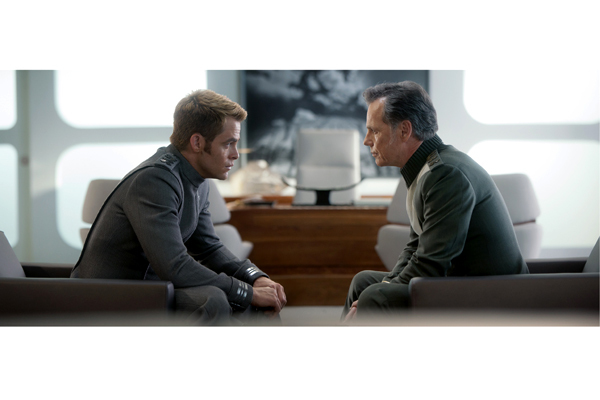 Director J.J. Abrams, Production Designer Scott Chambliss, Set Decorator Karen Manthey SDSA and their teams once again boldly take us into the STAR TREK universe with the gigantic hit STAR TREK INTO DARKNESS. 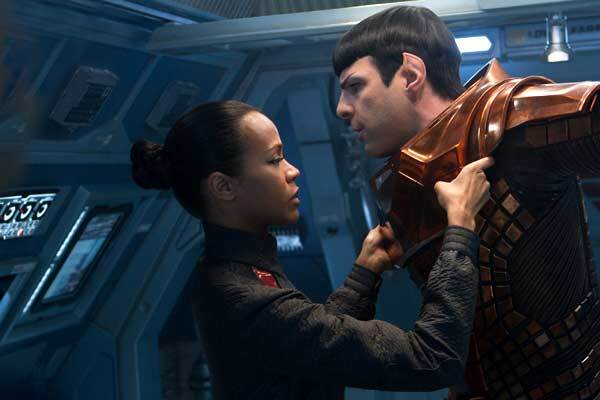 The second chapter of their retro-fresh re-imagining of the iconic series into 3-D IMAX has brought kudos from both Trekkies and those newly introduced to the ST world. 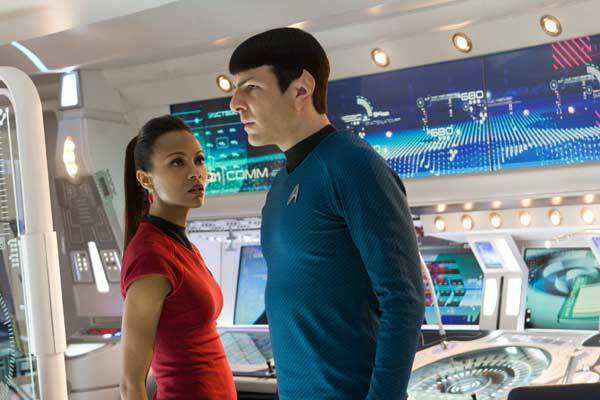 This team has a strong track-record, from the television series ALIAS to MISSION: IMPOSSIBLE III to now the re-creation of STAR TREK, based on the original vision of the series creator, Gene Roddenberry. Manthey visits with SET DECOR, giving insightful responses to statements by her teammates, and answering questions about the set decoration…sit back and enjoy the flight! 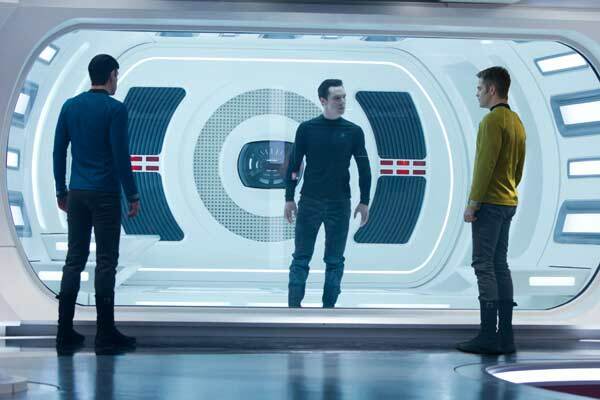 Director J.J. Abrams: Obviously, you can’t do a movie called ‘STAR TREK’ and not have green screen elements, but one of the things we’ve continued from the first movie is the idea of finding locations or building sets whenever we could to create a world that isn’t synthetic or sterile, but feels very, very real. Set Decorator Karen Manthey SDSA: You can see why working with these guys is such a pleasure and so meaningful at the same time…even with all the challenges this film presented! Scott and I have worked together off and on since 1992. Along the way, we’ve learned and grown together, and influenced and expanded one another. We developed a common visual language and an intuitive work process over the many years of collaboration. And his talent and creative energy have always inspired me. J.J. is a brilliant, generous, and talented director. He respects his crew and is open to their ideas, but he is also very clear about his vision. He is so amazingly supportive, and he brings a lightness to the work – he’s clearly having fun. 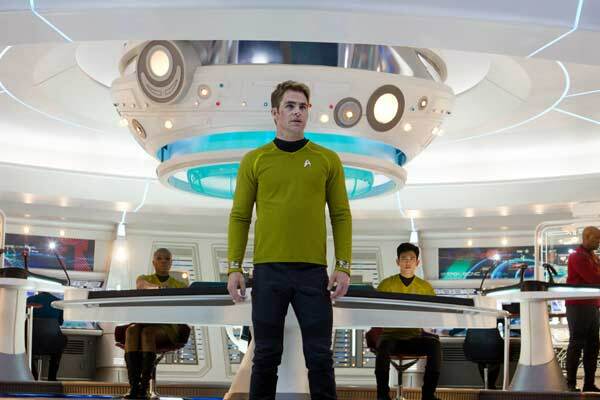 Director J.J. Abrams: We wanted to show audiences far more of the ship, and to give it more depth. On the first film, we worked hard to make the ship feel real and epically large, and for the most part, it worked. The problem, though, was that the Bridge was on one set, the Transporter Room on another, the Med Bay on another, etcetera. You could never do any kind of continuity. We had the opportunity this time to build a set that was contiguous so that we were able to go from the Bridge down a hallway, into the Turbo Plaza area and go around a corner into the Med Bay. It gives the ship a sense not only of scale, which is a fun by-product, but a real sense of being interconnected. Manthey: The sheer size of the locations we shot in aided us in creating the world of not only the Enterprise but also the Vengeance. 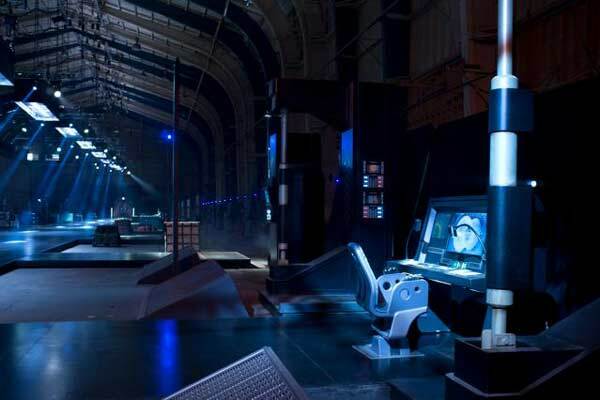 With the great length of the Playa Vista stage space, a 315,000 square foot (29,000 m²) aircraft hangar where Howard Hughes created the Spruce Goose, we were able to interconnect the sets of the Enterprise into one long run. On the opposite bay, we were able to give Kirk and Khan an ample runway for their crash into the Vengeance loading dock. The vastness of the structures at both the National Ignition Facility and the Budweiser plant, and their super-cool existing equipment, created a base for the inner core of both of these ships, which was then seamlessly integrated into our world. 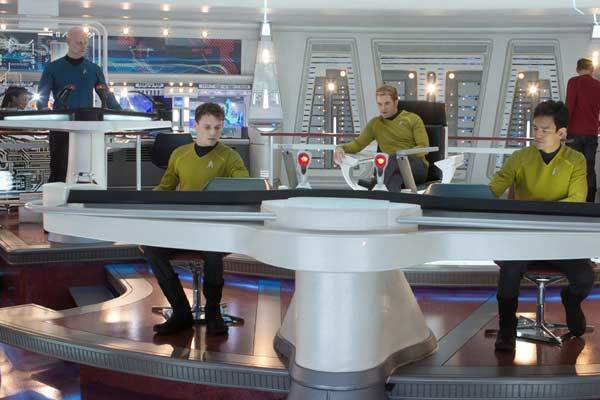 Abrams: Every element of The Enterprise was remarkable. Everywhere I looked, I was amazed…when the cast and crew come onto a set that’s so beautifully designed, it helps them believe in this place. 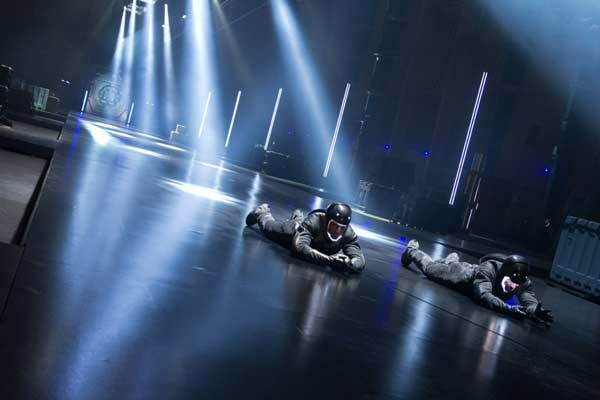 It elevates everything – the performances, the lighting, the camera work. It was helpful in every way, and it gives people a bigger view into this world that we love so much. Manthey: I’ve learned through each successive project to appreciate the essence of these thoughts from J.J. When large portions of sets you’ve worked on for days, weeks, if not months never make it to the screen, it’s hard not to be disappointed. But working with J.J. and experiencing the appreciation he shows for everything in the world we’ve created tempers that sense of loss. I understand and believe in the importance of the set during the shoot as a world for the actors to inhabit. 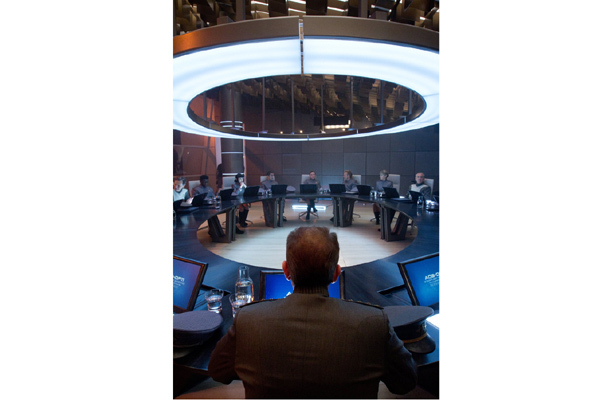 When we present a set to the director, the job of that set is to lead to an enhanced performance from the cast and crew, and with that, a better final product. That understanding has become a motivator for me in regard to working at the highest performance level possible. Abrams: We were there just trying to shoot a movie, but all around us, these innovative scientists are working on technologies that will likely help the whole world. The idea that one day the research at NIF could create clean, limitless energy is so exciting. On the one hand, it was simply a great location for the story. But more importantly, we were really honored to be welcomed there. These people are doing research that could alter the destiny of the planet the way the wheel or the light bulb did. We couldn’t even believe they let us in to shoot…and then, they were so excited about having us. 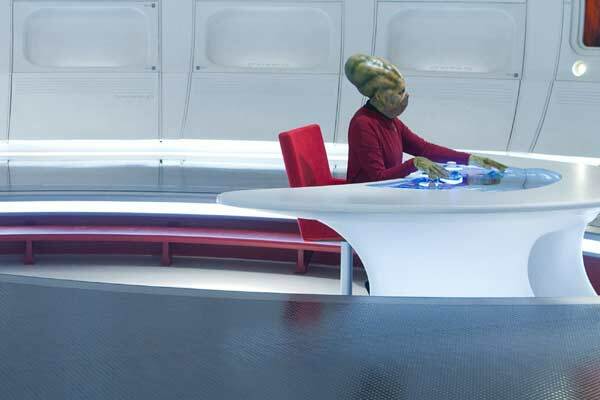 So many people told us STAR TREK inspired them to get involved in science. Manthey: As a set decorator, I encounter so many varied locations, each of them with their own specific history and requirements. To go into these places and get to really immerse yourself in them for days or weeks is often an incredibly unique experience. NIF was one of those. The visual beauty of it, and the level of intellect and ambition seen there is remarkable. NIF houses the world’s largest laser, and has the goal of achieving nuclear fusion with high energy gain and actually creating a miniature star on Earth! It was like a profound travel experience. 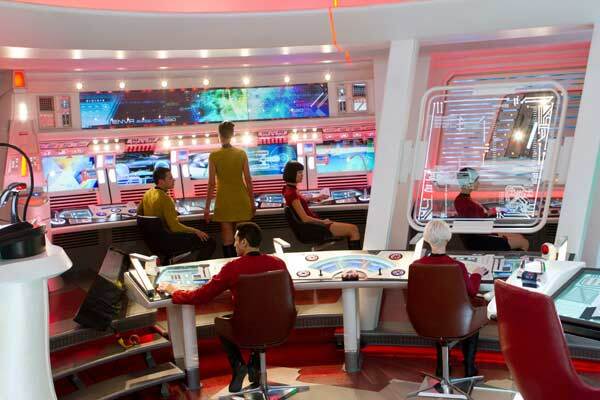 We brought in a variety of lighting elements, communication consoles with monitors, floor matting, and we barely squeezed in the enormous containers we manufactured that were designed to house the photon torpedoes. Manthey: I think I learned, and continue to learn, that it’s a balancing act to be intuitive, creative, a good manager, and continuously take careful aim with budgeting. There are constant shifts in design, scheduling and budgeting, and there are the challenges of working with large groups of creative thinkers. These large scale films are all about collaboration, and the team that you bring together will be critical to the final product. I think the biggest challenges parallel with life in general…attempting to create something truly valuable and aesthetically outstanding within the parameters of a very specific amount of time and money…balancing acts of creativity and logical problem solving. The set list was long…and revisions were many. Most sets had intricate details that needed to be worked out with multiple departments, so there were interdepartmental meetings daily, if not more often. …and always, of course, production and accounting. I’m a list-maker, and I made lists—a whole lot of them. I prioritized my lists and sometimes I abandoned them. Because not much on a project of this scale can or should be done alone, “we” is the more appropriate word here… We went around talking to people in all these departments every day. We attended meetings, all those many meetings. We took notes. We reviewed the script, which was kept for me in a secure safe. We developed boards of images for Scott and J.J., and we compiled lists of questions to ask each of them. We shopped, we acquired, we obtained. 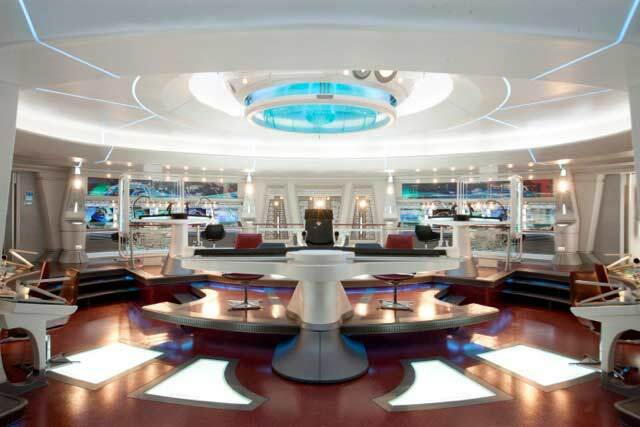 We reviewed futuristic furniture, lighting, gizmos and gadgets. We designed, manufactured, purchased, rented and borrowed. We accumulated monitors…a whole lot of them…and we dressed them into sets, and then we wrapped, inventoried, and stored them, and then dressed them into the next upcoming sets. We reviewed plans. We adjusted schedules. We read and wrote a lot of emails. We ran around looking for Scott, and/or J.J.
We adapted to a scattered but controlled rhythm. Along the way, there was a general thread of creativity and intuition at play. And at times it was great fun. And at times you had to remind yourself to breathe. SD: You mentioned “fun”. What was the most fun? Manthey: Well, the more personal sets always resonate the most with me, the ability to make a connection to a personality through their environs. I enjoyed working on the character sets of Kirk’s Apartment and the London home of the parents of the hospitalized girl. J.J. saw Kirk at this point in his life as technically a man, but still a kid at heart. We filled his apartment with futuristic athletic gear, a handmade retro turntable, a chess set made from vacuum tubes by British artist Paul Fryer, and a variety of gizmos and gadgets. The London home was particularly important to J.J. because it was intended to open the film. He wanted to depict an earthbound family environment…warm, grounded, with evidence of their experiences together. Musical instruments like the Yamaha Silent Electric Upright Bass and a glass terrarium housing a bonsai tree, as well as displays of vintage family photos and a glass fireplace were featured in the set. There was the opportunity in both of these sets to consider residential life in the future, and mix vintage and futuristic elements. The London hospital was shot at Greystone Mansion. We dressed the lobby area with futuristic ‘information pods’, pastoral landscapes entirely encased in plexiglass housings, a mix of traditional antique furniture pieces and modern/futuristic seating and lighting…and hospital equipment! We worked in collaboration with propmaster Andy Siegel on the IV unit that delivered the life-saving medication supplied by Khan. The bar where Scotty is drinking with Keenser was fun…also shot at Greystone mansion. We re-dressed an existing bowling alley with cool lighting and furnishings…lots of silvery beaded curtains to catch the light. I found it kind of a visual feast, a great backdrop for Scotty’s tirade. Manthey: They were shot at the Crystal Cathedral Visitor’s Center, designed by Richard Meier. 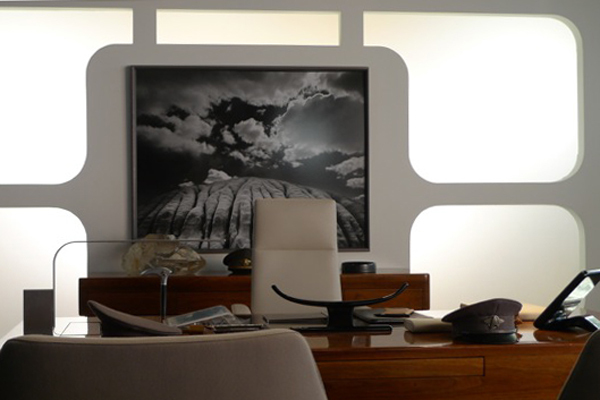 Both offices were spare and modernist, with vintage elements. J.J. envisioned Pike as a naturalist, so we incorporated images from professional nature photographer William Neill, and our multi-talented art director Lauren Polizzi. For Marcus’s office I chose two images by Paolo Uccello (c. 1396- 1475), one a fresco detail The Flood and another a perspective study. Since Admiral Marcus was also the dean of the Starfleet Academy, J.J. requested a series of models to depict the history of aircraft and spacecraft, from Kitty Hawk through the Vengeance ship. I worked with Andy Gore of Quantum Mechanix, which makes high quality replicas and collectibles for the film industry. They produce around 350 film-quality miniatures a year, and have the ability to create models old-school style (kit bashing from concept drawings) and also can convert existing 3D meshes into solid models and grow the model directly! I was assisted by Anne Tobin with timelines of the history of aircraft…and by legendary STAR TREK illustrator John Eaves and Andy Gore in regard to the history of spacecraft and specific STAR TREK history. James Clyne, our VFX Art Director, provided valuable guidance throughout the model building process. …Wright Flyer …Spirit of St. Louis …German V-2 …North American X-15 …Soviet Vostok …US Gemini …US Space Shuttle …Ares V …Ring Ship …Phoenix …NX-Alpha …NX-01 …USS Kelvin …and the Vengeance. Manthey: People. I couldn’t do without every one of the talented, experienced, and professional people who comprised the set decoration department. Success on films of this scope and budget are all about a highly experienced team who understand how to solve problems quickly and efficiently. To name a few experts: Leadman Scott Bobbitt, Assistant Set Decorator Amanda Moss Serino, the incomparable Brett Smith, Buyer Sara Philpott, Coordinator Anne Tobin, On-set Dresser Merdyce McClaran, and Damon Allison, who headed the talented members of our set decoration prop shop. SD: Please tell us one secret [or maybe more] to maintaining sanity on a film of this size! Manthey: Ask your own team for feedback, and be open to it. Keep an open and transparent relationship with everyone, especially production. Ask your UPM for help when you need it. I can’t say enough great things about Co-Producer/UPM Tommy Harper and Executive Producer Jeffrey Chernov. They were there to support at every turn.